Bag of nerves - should be the best phrase to describe the Lions' first-half performance at Shah Alam. Fortunately, they managed to regain the composure and put up a much better display in the second half with "Ah Long" (Noh Alam Shah, pictured on the left with the blogger) headed home the equalizer. 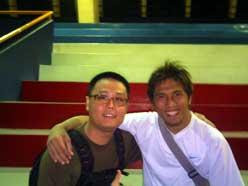 The talking point should be sending off of skipper Aide Iskandar (pictured on the right with the blogger) initial sources claimed the skipper returned to play without the ref's permission) and Lionel's leg that saved the game for us.